Sharing my challenges and adventures having a cerebral shunt. Last week, while volunteering at a local nonprofit organization....I got stabbed in the finger with a loose staple which was attached to an envelope I had opened. The staple stab didn't hurt as much as my shunt does when the weather changes. I mentioned the shunt weather change issues with my new neurosurgeon during my appointment earlier this month. The new ns had made three attempts to get me to return to the surgeon who did the last shunt revision I had in 2014. Now there are pieces of my old shunt are floating around my peritoneal cavity and lodged inside the right side of my neck. Going back to him was not an option. He ended up getting animated in one of my films. I told the new surgeon what type of shunt I had and faxed him a copy of my medical history with all of my previous neurosurgeons and copies of my operative reports from 2009 - 2014. Copies were made in the doctors office of my x rays and CT and MRI scans which I have on CDs. Overall, the appointment went well and I felt my voice was heard. The surgeon told me I don't have one neurosurgeon though. When I have to have a revision, it's usually the person who is available when you get to the hospital Emergency Room that will do the surgery. So I made sure to emphasize what had happened in my shunt revisions in 2009 and 2014 and how it wasn't going to be repeated. EVER. This is the one thing I've become super paranoid about since my injuries in 2014. I don't want anyone operating on me again unless it's absolutely necessary. I'd rather have a cut finger wrapped in a bandaid then have to endure more brain surgery. When I volunteer now, I'm carrying a small first aid kit in the event of more battles with office supplies....or anything else I encounter in the field. The only different this time, was I had a referral to see a neurosurgeon from my neurologist. I wasn't about to take 'no' for an answer, either. 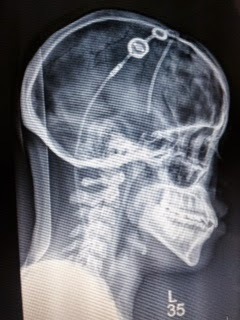 The last time I didn't have a neurosurgeon ( and whoever was available performed surgery ) my shunt was placed on the wrong side of my brain and stayed like that for five years until it was finally repaired (twice) in 2014. I don't want to have surgery again unless it's absolutely necessary. Yay!! For me for being persistent! I also saw a rainbow earlier in the week before I achieved success in getting my Dr. appointment. 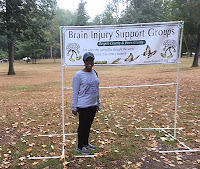 Earlier this month, I attended this years Brain Injury Walk with my friends and family. 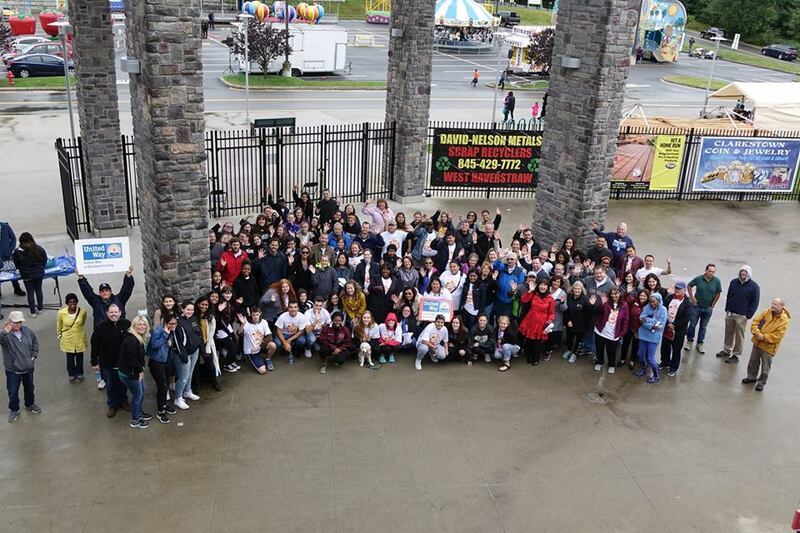 It's always nice to see such a large group of people who are impacted by brain injury. Every other year the brain injury support group has their logo ( a walking brain ) paired with a shirt and hat. I also attended my local brain injury support group earlier this week. 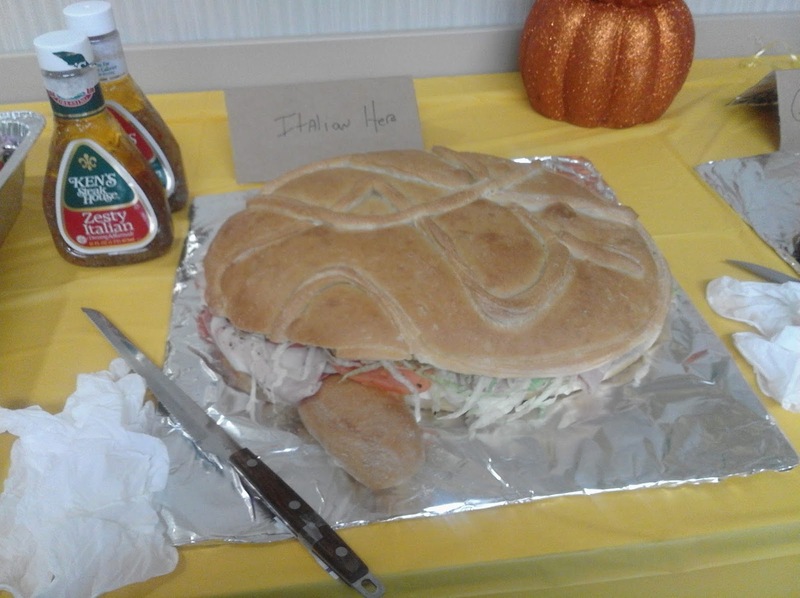 There were brain shaped sandwiches and salad. 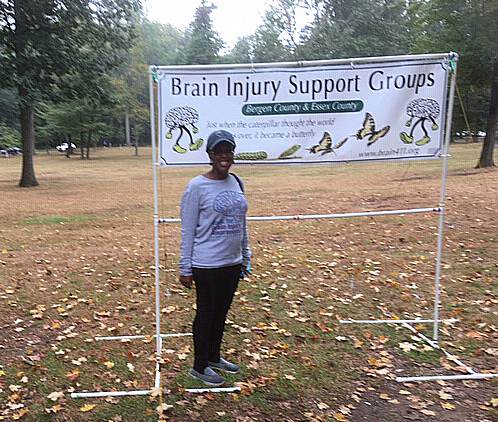 Myself at brain injury walk 2018. We had a great discussion about some of our goals and things we'd like for the future. Some people shared their information about dealing with the comments of people who just don't get that what it's like to deal with a brain injury. With a brain injury, it is invisible and often times, people just think that there's nothing wrong with you since you don't look sick. I had someone tell me this recently. You don't have to look sick to be in pain. One of the reasons I made a film about my brain injury experience was to educate others about the impact this type of injury can have on individuals and people around them. Close up of brain injury 2018 logo hat. Attending support groups and these walk events for me is therapeutic and I learn a lot from others I meet also impact by brain injury. There are lots of survivors who feel misunderstood. I find comfort in being able to surround myself with others who have empathy for the injuries you have an can relate. On one weekend in September, I volunteered with my local United Way assisting with their Day of Caring event in my area. This was a great chance for me to get out of the house. I had the usual head and shunt issues as I've been having for months now. I'm glad was able help on that day and fortunate enough to travel despite having head discomfort. A group shot of myself with several other volunteers at United Way last month. Soon I will see a neurosurgeon about future treatment for my shunt. I have apprehensions about this from past experience with doctors not taking me seriously in the past. So we'll see. I may even give this new neurosurgeon a copy of my film, Shunt Chronicles (2015) for repeated viewing so he knows what NOT to do. One of my brain injury awareness shirts. X Ray of my shunt in 2014. September is Hydrocephalus Awareness Month (HAM). I have collection of brain injury shirts I've acquired over the last few years from Teespring.com. Today, I have head issues as usual. My medical device continues to adjust each time I move my head. Sometimes when I'm moving from crouching down near the floor to standing up I get a rush inside my head and dizziness. This also happens when I move my head from side to side. I try not to take pain medication everyday only when I feel I really need something. I also have pain behind my right ear today....fragments of my old shunt are still there and they're in my abdomen too...Those pieces couldn't be removed. Earlier this summer, I made a short film, Life with a Shunt (2018) about what it's like for me to live with a cerebral shunt inside my brain. My experience doesn't reflect every one's daily life with one of these medical devices. I made this film, because of the response I received from my previous film, Shunt Chronicles: My brain, art and school (2015) Someone had said mentioned to me they didn't get a sense of what it was like to have a brain shunt. I wasn't about to add an extra scene into the film, as I would have to get it transcribed again for new subtitles. My battle scars from shunt surgeries in 2014. As mentioned before, I would like better treatment options. More reliable shunts, like ones with expiration dates so you know when surgery might be needed. I mean, food and beverages have expiration/sell buy dates...why not medical devices? Maybe as they bring in more robots in to the operating room, mistakes will be reduced...? Butterfly seen in July trip to Hersey Park. This summer has been the most uncomfortable for my shunt. I don't remember the previous year being this awkward. Ever since the weather got more humid, I've had consistent nausea, shunt, scalp pain. In addition to right eye pain. I did however, have two weeks in June and three days this month were everything was perfect. There were rainbows and butterflies happily dancing inside my head. ( I use this as an example because seeing rainbows and butterflies outside makes me happy). Not feeling well from my injuries and shunt often brings down my mood and makes me less social and isolating. Sometimes I just want to stay home and read/draw because having to interact with a group of people is information overload on my brain. When I meet my new neurosurgeon, I'll inquire about him checking the settings on my shunt. Most of my pain issues vary from recovering from my injuries to the shunt adjusting and readjusting every time I move my head. Checking the settings would make me feel better knowing it's on the level it should be. I do wish I could have a non programmable shunt valve. Unfortunately, there isn't much I can do about this. I went to see Incredibles 2 earlier this month with a friend. There was a strobe light warning before the movie and I don't have a history of seizures, prior or after my brain injuries. Just to be safe, I closed my eyes or looked away during the scenes which included flashing lights. After the film, I felt a little dizzy and when I sat down again while eating, (I was in one of those bar stool chairs ) my sense of space was off and I felt awkward being elevated. This feeling was only temporary, I attribute this to the strobe lighting during the movie. Even though there was a warning about a seizure triggers, it made me wonder why the studio who made the film, would even include this effect at all. Overall, I enjoyed the movie and had a chance to get out for a few hours. Sometime in 2015, my phone's led light flickered for a second, it was about two feet away from where I was sitting. I felt a throbbing sensation in the back of my head. This only happened once, although it made me wonder if this reaction was related to my brain injuries. My local brain injury support group had their annual barbecue at a local park this week. To show unity in our group, we each painted one nail red. Everyone including myself brought snacks and other foods for everyone to enjoy along with the prepared food. Besides going to the annual walk events, it was great to see some people from the support group attend this barbecue. While we were there, I there was a camera crew filming a commercial. There was also another group flying drones into the sky. One drone had a blue balloon with the earth painted on it. One of two drones at the park. This was quite random for me to see in a park during the day. I saw another brain injury group member in their wheelchair taking photos of the park. I walked over to him and we had a conversation about the drones and the weather. He had explained to me how drones are more dangerous for helicopters because helicopters fly lower at the same height as drones. Airplanes fly at a higher altitude and are unreachable by drones. Drones cannot travel as far. After our conversation, he returned to take photos around the park. Moments later, I was approached by the group flying the drones. They explained to me they were filming random acts of kindness and saw my interaction with the man in the wheelchair. They said thank you for showing an act of kindness and they gave me a thank you card. I was having medical device issues since 2am this morning which continued until almost 12pm even after taking pain reliever pills. Some pain issues continued this evening on the way home. Overall, I'm glad I was able to locate this support group meeting and enjoyed conversation and company of other group members. I look forward to attending more gatherings when I'm able to. The pain free medical device sort of vacation is over for now. Since the end of last week, the shunt and eye pain has returned. Depending on how intense the pain is, I stay home. The week of June 12, I went with a friend to Hersey Gardens. The heat wasn't too bad that day. I did have a bit of a brain breakthrough on the way home. I was getting hungry during the evening ride. As the hunger progressed, so did my head and shunt pain. To make things even better, there was some pain from the distal catheter in my abdomen. I tend to get a little hangry when I need food. Once I had eaten my shunt and head pain disappeared. So not only is my shunt affected by the weather, other magnetic fields....I can include hungry pains too. Butterflies make me happy, which was one of the motivating factors in going to Hersey Gardens was to see them. As the weather has been getting more humid and into 90 degrees, it's made the shunt go crazy again. Yesterday, the pain in my right eye returned as did more pain from the valve. Because it's been so humid outside, I get the same issues I was having when the barometric pressure drops in the winter. Last summer, I don't remember things being so intense during the summer. This week, I've had dizzy spells, shunt pain issues, nausea and of course, pain in my right eye. With eye patch after injuries in 2014. 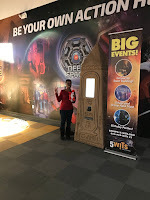 Earlier this week, I went with a friend to Madame Tussands Wax Museum. I can relate to the Marvel character, Nick Fury as he has a patch on one of his eyes. As a result of my brain injuries in 2014, my right eye had been moved which caused double vision. For about one year and thirteen days, I had my eye covered. In the beginning I wore a patch on my eye. Then upon seeing a neuro-ophthalmologist, he had insisted I just cover one lens of my glasses. The love hate relationship with my shunt often drains me at times emotionally and physically. There are times when I question my purpose especially when I'm in pain. I have developed healthy coping mechanisms to deal with the 'the shunt is driving me insane' moments. I cry, scream, go exercise, then put head down, repeat. Not working for medical reasons doesn't help and I'm often times I'm home....I tend to isolate myself sometimes when I'm not feeling well. I do get out on some occasions for volunteering, support groups. For almost two weeks, my shunt has been behaving. It's sort of a shunt miracle to have had a several days without any discomfort. Last night, I had some brief pain issues. Nothing nearly as bad as almost a month ago, when I had stabbing pains in the shunt valve, right eye and distal catheter pain/nausea. Earlier this week I went to my local brain injury support group which meets at a nearby medical center. This meeting was a separate group for caregivers and survivors. The last time I had attended one of these groups was last year and it was a combined group with both caregivers and survivors. 1. I have the right to have my own unique feelings about my illness or injury. I may feel mad, sad, scared or lonely. I may feel numb or sometimes not anything at all, No one will feel exactly like I do. I think some people don't want to feel the pain you're feeling or they just don't know what to say. Or they just don't want to think about what you actually went through because it's too painful for them to experience. 2. I have the right to need other people to help me with my grief. Mostly, I need people to realize that my grief is normal and people who will listen to me without judgment. One of the reasons I'm going to attend more support groups in my area. The one I went to earlier this week also has a walk event every year which I went to last October. They also have social gatherings. This summer, they're going to have a bbq for the group. 3. I have the right not to 'think positive' or 'be grateful' when I am grieving these losses. I've had people right after my injuries tell me I needed to be more grateful because there were people worse off than me. My response was I never said I wasn't grateful. It was easy for me to re-learn the first three years of my life. I've offered to give people who say this to me the same injuries I had and they usually stop talking to me about how I 'should' feel. Last week, my medical device caused me pain in different parts of my head, neck and face before a lightening/thunder storm. This week, the vertigo, and tinnitus I haven't had for a while now has returned. I'd rather have these symptoms than varying degrees of pain and discomfort. With both, putting my head down and taking some pain reliever/moderate exercise helps. I've found it a challenge at times to explain to people why/how pain affects you the way it does. People who haven't experienced brain injury and what happens to the body after sometimes don't know how to interact or respond to someone who is experiencing pain from a brain injury. Some of the pain I've experienced is related to things in the atmosphere such as weather, other devices in the area, or stress. When I hear things like 'Oh it's just the weather' or "Just take something for the pain' Sometimes the pain doesn't go away with pain reliever, it only diminishes to then return again later. I've provided things for people to read about pain management and brain injury. I do believe when it's family members who inquiry about your pain, they don't want to remember why you're feeling the way you do. Sometimes it's just too much for them to deal with emotionally. There are also some people who don't have empathy. This afternoon around 3pm when the sun started to emerge from the clouds, my shunt and right eye pain returned. It's suppose to rain tomorrow. A family member told me this afternoon regarding my pain 'You'll feel better soon' My reply was 'Yes, I will, it's just that my head and eye doesn't know that right now. Right now, I feel pain that hasn't gone away for a few hours now.' When we feel pain, do we have to apologize in advanced for feeling grumpy or tired? Too bad separation isn't an option. Unless I want my brain to herniate without you. Hamsa pendant I made at library earlier this week. Monday, Tuesday and Wednesday this week I had consistent all day shunt pain, nausea and right eye pain. Not sure where the right eye pain was coming from. Whether this was related to TMJ or my eye surgery 3 years ago. I suspect shunt pain is from the thunderstorm we had on Thursday night. Yesterday and today have been better. Tuesday, I had an arts & crafts workshop at my local library. The shunt valve pain was bad and I decided to attend anyway. I had to leave early as the pain was bothering me. I was happy to put my head down once I got back home. Pain reliever minimized the pain, only for it to return later. I also don't make a habit of taking too many pain relievers during the day. For three days this week, I felt like an ice pick had been stabbed into my right eye and top of my shunt valve. This all started on Wednesday afternoon after I saw my neurologist for a yearly appointment. I still have balance issues and some weakness on my right side. I had one good day this week, which was yesterday....Today is just 'ok' better than earlier this week. Brain birthday ice cream with candles. anniversary in 2015, because I still had double vision at the time. Each year since then, I treat myself to a movie or dinner to celebrate surviving the experience. I'm not saying almost dying in the hospital after a shunt revision surgery wasn't horrific, it was. I just try to reframe the memory, while not forgetting how upsetting it was for me. Anyone who survived a brain injury will probably tell you, it's not an easy things to recover from. Recovery is different for everyone and can years. It's been four years and I still have effects from what happened to me such as: balance, pain and walking issues to name a few. It's going to snow at some point during this week, I know this because I was checked the weather report. And as usual, my shunt is aware of the change in the climate outside and therefore cause pain and dizziness. Last month, I went with a friend to 5 Wits at my local shopping mall. Despite my shunt being unruly, I still managed to have a great time. This also allowed me to get out of the house. Today there is right eye pain along with some nausea from the shunt. I still went out to volunteer with my local Meals on Wheels and when I was done, I returned home to put my head down. Oreos on a stick during wedding reception. I noticed in some social situations, where there are gatherings of many people I get sensory overload. I didn't have this issue before my brain injuries. Sometimes I have a challenge with expressing myself like describing emotions. This happens with speech and in writing. It takes me a while to hand write a note or letter to someone. I can feel the the information get stuck inside my brain and it struggles to get onto paper or in words. Especially when in the moment, I may not realize why there's confusion inside my head only to realize after the fact what happened. I went to a friend's wedding this weekend was so happy to be there and like 5 Wits I had a great time. I still was able to recognize when I needed to be alone sometimes for cognitive reasons related to brain injury. Sometimes after a brain injury, the brain isn't able to filter all the information it's receiving at the same time. We don't realize sometimes how much processing we're doing on a daily basis. I had two okay shunt days so far this week. Today I feel dizzy, I suspect because we're getting a foot foot of snow tomorrow. Putting my head down will alleviate some of the discomfort. I finished a book yesterday called The Danger Within Us: America's Untested, Unregulated Medical Device Industry by Jeanne Lenzer. The book was recommended by someone on Twitter and I was able to get a copy from my library. The Danger Within Us discusses the history of the American Medical System, problems which arise and are still continuing for patients and doctors. My jaw was on the floor several times while reading this book. Just in the introduction alone, I was stunned at what I was reading. I couldn't believe the FDA ( food and Drug Administration ) can approve medical devices ( cerebral shunts, stents and others ) without verifying whether these devices are actually safe to use on people or not. As long as they work ( and $$ ) then that's what matters. I knew this issue existed in the use of drugs and pharmaceutical companies. I've been given medications after my brain injuries in 2014 which were supposed to be for pain management. Several times some of the drugs I was given either gave me extremely depressed/suicidal or I had psychotic episodes. I also felt my shunt was reacting to the medications I was given. The Danger Within Us also talked about medical devices which can be controlled wireless. What's stopping someone from hacking into a pacemaker from another room and disabling the device? Things I didn't think about until reading this book. It's only inspired me to write to my local legislative officials perhaps policies can be changed regarding medical devices and the care we receive upon having them inserted into our bodies.